We made a fun little video to get folks excited about the Wide Eyed Wonders Graphic Poetry Project. We're excited to share our sister Carolyn's Poetry and hope you will be too! Most of the video was filmed in Boise, Idaho - including in Freak Alley - a wonderful place where artists share their talents in downtown Boise. Some 'dream sequences' were filmed at the Indiana Dunes National Lakeshore and in Angouleme, France. Front: Christopher, Carolyn and cousin Gabriel Reilly (in Carolyn's arms). 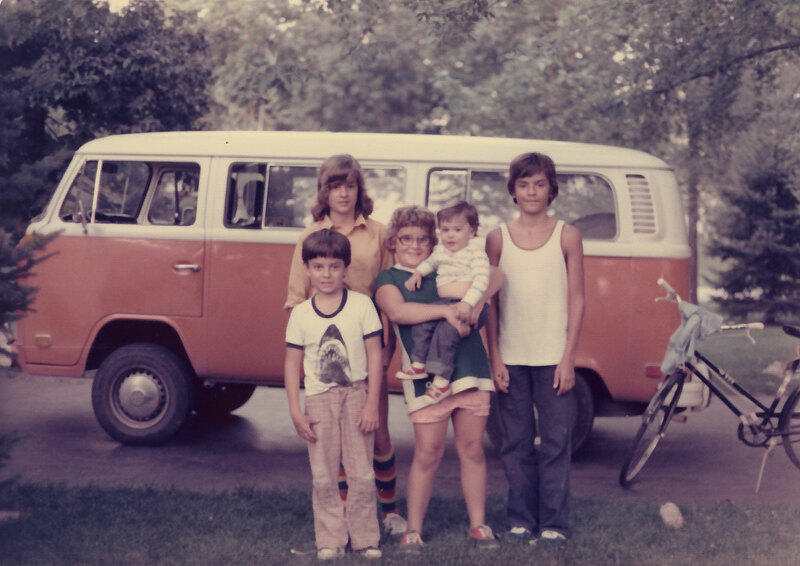 ...pictured in front of our Dad's awesome, new-ish 1974 Creamsicle VW Vanagon Bus in the driveway of our Barrington Woods, Illinois home... circa 1976. The Wide Eyed Wonders Graphic Poetry Project team consists of 4 siblings: Carolyn, Jennifer, Geoff and Chris. Click here to reserve the poem you'd like to illustrate - and become a part of the Wide Eyed Wonders Graphic Poetry Project!